Camping Season Has Arrived ! My kids were older, both teenagers when we started camping with our family. Our first trip was as part of a larger group of families that camped every year over Father’s Day weekend. We bought a large tent, tarps, a camp stove, and a lantern. We already had sleeping bags and other essentials. We bought some old pots & pans / dishes at a garage sale. We had a great time. We did this each Father’s Day weekend for 3 years. It was our only camping trip each year. Then my hubby and I decided we were getting tired of sleeping on the ground, so we bought a used pop-up camper. We continued with the annual trip each June for a few more years. Now the kids, ahem … young adults go on this annual trip without us. Over the past few years, it has been just the hubby and I, and we really like it. We enjoy the peace and quiet 🙂 We usually plan a 3 day weekend camping trip for June, July, August and September. This Spring, we took the plunge and bought a used travel trailer! No more middle of the night trips to the bathroom for us 🙂 We actually bought it off EBay and went to pick it up last week. We were so excited when we first saw it. We knew from the eBay description that there were a couple of minor things wrong with it. It’s a 1999 model, so just age alone was a contributing factor. We trusted the seller when they said that there had been a previous leak but it had been completely repaired and no longer leaked. We trusted the seller when they said the awning had a tear but was still usable. We trusted the seller when they said that the crack in the plastic vent cover was only cosmetic. Then we drove home with it, six hours in the pouring rain. Then we parked it outside our house for the night, and it rained all night long. The next morning, the sun was out, so we decided to start moving our camping gear from the pop-up to the new trailer. The first thing we noticed when we went to unlock the door was that the entire plastic vent cover was gone … it must of blown off during the long ride home from southern Indiana. So, I taped a piece of plastic over it so the back of the refrigerator didn’t get any more wet than it already was. Then we went inside to discover that it did leak … not giant puddles, but the wall was moist and soft to the touch in the same place the previous water stain was. We then opened the awning to find the tear was nearly half way across. I was mad … so mad. I hate being lied to. So I waited a couple days to cool off, then sent a (very professional, not emotional) ebay message to the sellers explaining that we were very upset that we had been deceived by their description, and that we thought they should be responsible for the cost of the repairs to get it to the way it was described as perfectly usable. I waited a week for them to respond, and then I opened a resolution ticket with ebay motors. EBay has strict guidelines about items being “as described”. They will investigate the situation and try to work with us to get some of our money back. We are taking it to a RV repair place to get an estimate for the needed repairs. Hopefully eBay will convince the sellers to cover those costs. 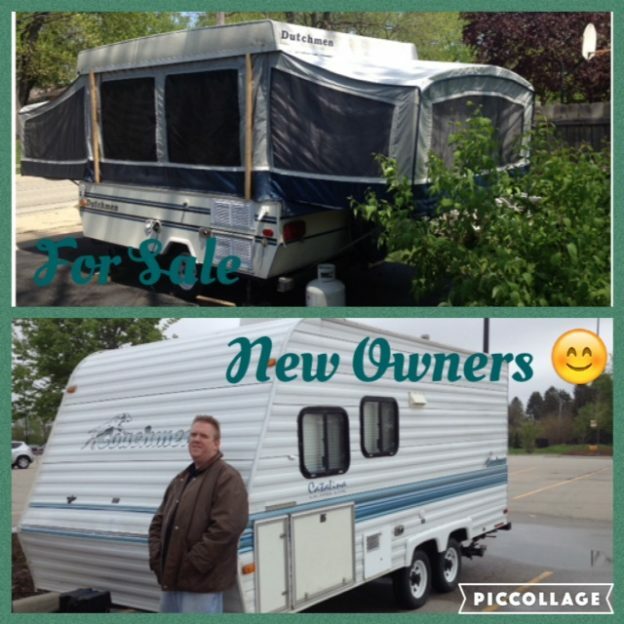 This entry was posted in Seasonal, Travel and tagged camper, camping, ebay, Family, nature, pop-up, trailer on May 14, 2016 by Tracy.